Apologies to anyone else named Joe who wants to blog about trying to make roguelikes. New release has new features like full-color lighting, streamlined controls, and more fiendish multi-tile traps! Also, cockatrices. Watch out for those. 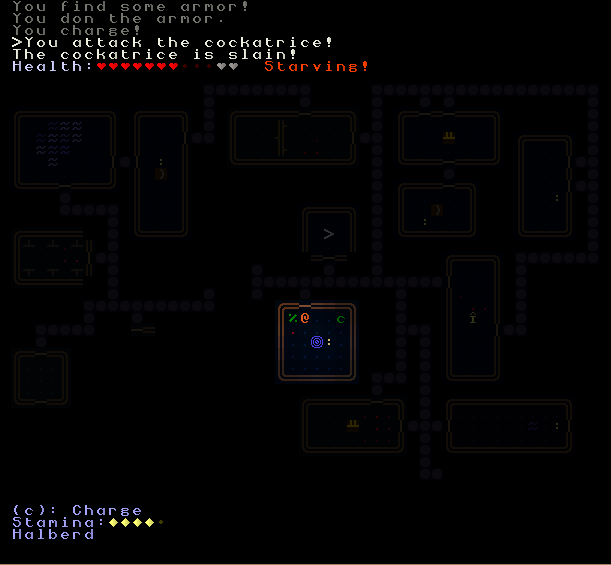 Dungeon-Themed Starvation Simulator is finished as of last night! Have fun! Please let me know in the thread if you have any questions, comments, suggestions, or bug reports! I like it, especially the traps. Very clever. Turn based traps are hard to pull off, you did an excellent job. Reminds me of prince of persia in a way. I like the stylisation that comes from the URR font. It reminds me of the style used in old ZX Spectum and Commodore 64 games back in the day, due to the limited graphics. Thanks! I'm a big fan of the font as well! (As you'd guess ) Saw it on the URR dev blog and was blown away. Hey man the link for the download of your game is broken on the 7DRL website because of the site switch over. This looks pretty cool. Unfortunately, it either doesn't support fullscreen mode or I just couldn't figure out how to do it. LAck of fullscreen makes it almost unplayable for me personally since it opens in a pretty small window that I cannot resize and my eyes just aren't good enough to make most things out. Fullscreen mode support would be very appreciated. Oops - I may have forgotten to list that one in the readme haha. I've got fullscreen working on my computer (and if other libtcod games go fullscreen for you, this one probably will) and updated the link with a new version. You should be able to press ALT+ENTER to enter fullscreen. Please let me know if it still isn't working, and thank you for the feedback! Coulda sworn I tried ALT+ENTER before and it didn't work. Seems to work fine now though Thanks. One thing, it seems to move a little laggy. There is a distinct delay between key press and movement. I'm using the win.exe version and running win xp sp3. It would be nice if there was some sort of confirmation before going down stairs or a go down stairs command instead of automatically descending just by walking on them. Went down a good few by accident. Also, would be nice if you could move by mouse click and/or be able to have a keyboard look command (forgive me if there is one already and I missed it). Just kinda awkward to use the mouse for only looking. . Thanks for the feedback! The lag's probably the result of my lighting system. I basically use libtcod's line function to brute-force raycast everything, and do a full pass of that every turn. I could definitely see how something like that might cause problems on some computers. I've got at least one way to make that more efficient (by only recalculating light sources when they move or change lighting) and will work on implementing a toggle between full lighting/lighting, but no flickering/no lighting to accommodate as many systems as possible. I'll also try to get a cursor and mouse-move into the next version. I look forward to play the game. Is the game open source or not? Bow to me, your evil programmer or I will destroy the internet with my 'delete' button! Wow, first time I've seen this - the traps are really cool - is it in real-time? Trying to download but the executable link appears to be broken.